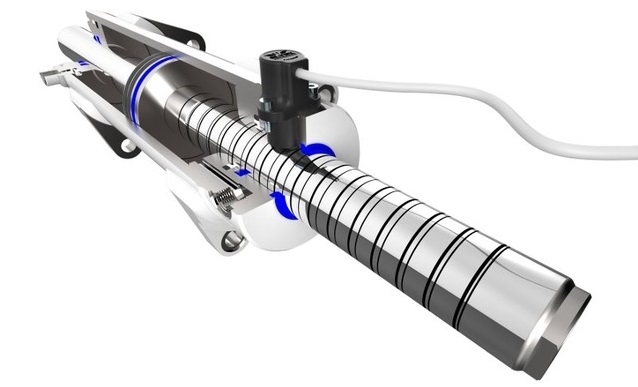 The eLynx measuring technology by Optoi Microelectronics and Giuliani has started to approach applications requiring longer hydraulic cylinders. Applications up to 1500mm are now possible after the new patented coding. The accuracy of 30µm remains the same as in the short-range versions also for longer versions thanks to high-precision embedded sensors; for this reason, this technology is extremely appropriate where precision is an important requirement. What is peculiar to the eLynx technology, and also its main strength, is the know-how of the two companies, which allows a vertical control over the design and manufacturing processes. Starting from the silicon design of the transducer and its production, through electronic design and assembly, up to the marking techniques and mechanical design of the cylinders and additional parts, Optoi and Giuliani are in full control of the production chain. All the systems are 100% controlled, and the highest quality standards that characterize the two companies are maintained. eLynx is a mechatronic system, where mechanics, electronics and microelectronics have joined to create an integrated and reliable system. The eLynx family offers a wide range of solutions, from single to absolute position sensors, with a single or redundant channel and also with diagnostic functions to help customers build safer vehicles or any other kind of machinery. At present, some of the main applications are: steering functions for trailers, stabilization control for harvesters and forestry machines, precision steering for trench cutters, safety controls on stabilizers, suspensions control, and many more.